Forty years after a Swedish hostage drama gave rise to the term “Stockholm Syndrome”, the phenomenon is still being used, and misused, to explain the reactions of kidnap victims. 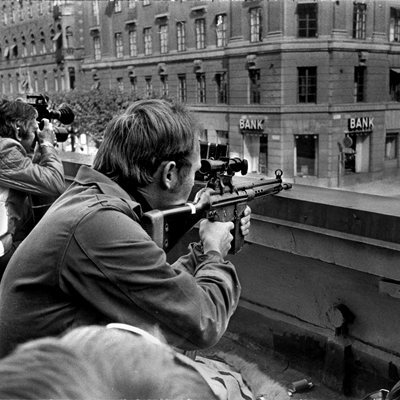 -Police snipers on August 24, 1973 on a roof opposite Kreditbanken bank where Jan-Erik Olsson was holding workers hostage. Forty years after a Swedish hostage drama gave rise to the term “Stockholm Syndrome”, the phenomenon is still being used, and misused, to explain the reactions of kidnap victims. “The hostages more or less sided with me, protecting me in some situations so that the police wouldn’t shoot me,” said Olsson, then a convict on furlough from prison, and now a peaceful 72-year-old. “They even went down to use the bathroom and the police wanted to keep them there, but they all came back,” he told AFP. The five-day hostage crisis, the first to be broadcast live to a mesmerised Swedish nation, created even more drama after police agreed to Olsson’s demand to have one of the country’s most notorious criminals, bank robber Clark Olofsson, brought there from prison. Olsson, much less of a celebrity at the time, had kicked off the drama with the memorable line, “The party has only started!”, and initially he had scared the hostages. 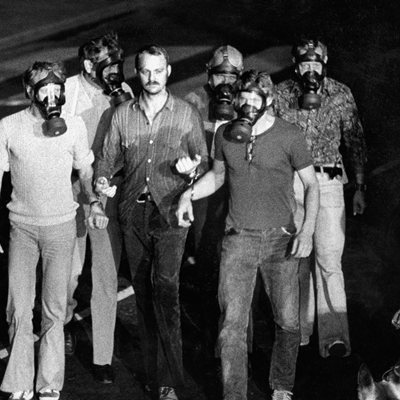 Picture taken during the siege at Kreditbanken in Stockholm that began on August 23, 1973. The five-day hostage crisis, the first to be broadcast live to a mesmerised Swedish nation, created even more drama after police agreed to Olsson’s demand to have one of the country’s most notorious criminals, bank robber Clark Olofsson, brought there from prison. After a while, however, the fear turned into other more complex feelings, as a shocked Swedish public learned from one of the first telephone interviews with hostage Kristin Enmark. “I’m not the least bit afraid of Clark and the other guy, I’m afraid of the police. Do you understand? I trust them completely. Believe it or not, but we’ve had a really nice time here,” she said. From then on, the roles of captor and captive have been seen in an entirely different light, and the “Stockholm Syndrome” still conveys expert status to Frank Ochberg, the American psychiatrist who coined the expression. First, there are “the parts that generate attachment and even love on the part of the hostage for the hostage holder,” he said. The second part is the reverse — when the kidnapper reciprocates and begins to care about the victim. “That’s the reason we sometimes want to generate the Stockholm Syndrome if we can, when we’re dealing with a hostage situation,” he said. The third element is both parties’ mutual contempt for the outside world. “Very early on, they are denied the ability to speak, to move, to use the toilet, to eat. And then they are given those gifts of life, and as they receive them they have the feelings… we have when we are infants and close to our mother,” he said. At first, there was a “pendulum swing” to always look for it, but after FBI negotiators questioned its prevalence, it “swung back to where I think it should be, somewhere in the middle,” Ochberg said. But she admitted crying when hearing about the death of her tormentor, and has said she has “grown apart” from her parents, leading to speculation that she might be suffering from Stockholm Syndrome. “Once a person is set free, they may feel closer to their captor than to those who were prior friends and family. I wouldn’t call this Stockholm Syndrome,” Ochberg said. “I don’t think I would like to have (the robbery) undone because it’s been a large part of my life and a lot of things have happened afterwards,” he said, but added that he did regret all the years of his life he spent in prison — even though two of his hostages came to visit him there. This entry was posted in Uncategorized and tagged August 23 1973, bank, Clark Olofsson, Drama, Hostage, Hostages, Jan-Erik Olsson, kidnapped, Kreditbanken, Machine Guns, Machine Pistol, Natascha Kampusch, Stockholm, Stockholm Syndrome, Sweden, Swedish, The Stockholm Syndrome. Bookmark the permalink. Undoubtedly, one of the most interesting syndromes from the psychological perspective and, in my opinion, very difficult to treat.